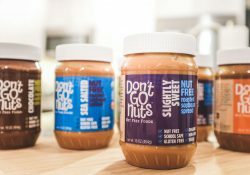 These are some of my tried and true favorites for any food allergy family. I’ll keep adding new items as I come across them, and please send me anything I may be missing! We LOVE this lunchbox. A PlanetBox is an investment in your child’s safety, nourishment, the environment, and your own time for many years to come. Instead of washing eight dishes every night, we wash this. When it comes time to pack lunch, we fill the Rover and we are DONE. Ollie can open it on his own. It travels with us on the weekend and we know he’s eating from a safe spot. With the bag, there is space for a drink, dry snack (in an itzy ritzy bag of course), and silverware. We used stickers from Mabel’s Labels and Show Your Teal to customize our box (so much easier than taking the magnets on and off). With stickers, you can highlight your child’s allergies and make sure all around them are mindful of what is needed to keep them safe during mealtime. The price tag is hefty, especially for a deal lover like me, but I’ve heard of people using their PlanetBox day in and day out for five-plus years. When you add up what you spend on containers and bags over that time period, it does pay off. 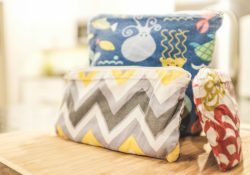 These Itzy Ritzy Snack Happens Reusable Snack and Everything bags (whew, what a name!) get constant use in our house. I was really frustrated with the amount of plastic waste we generated using zip loc all the time so went in search of a durable, reusable bag. After trying a few different brands, we landed on these. They’re thicker than a lot of other brands so they work for “wetter” items like fruit. The zipper is strong but possible for toddler hands to open. Best of all, the bags are washable. I flip ours open, throw them in our regular laundry, and hang dry. We’ve had some bags for four years and counting! This is the only “milk” we give Ollie. Being allergic to all nuts and peas limits the non-dairy beverage options. 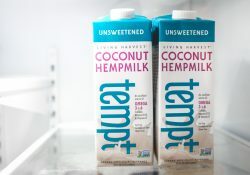 The addition of hemp to the coconut packs a stronger nutritional punch as compared to coconut or rice milk alone. The only place we’ve ever been able to find this is a local health foods store, Healthy Living, but you can also order it online. I believe some Whole Foods carry it as well. The shelf-stable selections are widely available but those have sunflower lecithin. 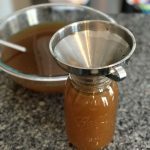 My husband and I use this in cereal and occasionally drink it on its own. It has a slight vanilla taste that is great for baking but not for a savory dish. For that, I use regular coconut milk. We are a classic example of the atopic march. In trying to combat eczema, a humidifier is key. Skin is especially irritated when dry. 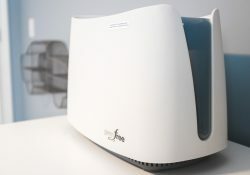 The best humidifier for kids with eczema is the Honeywell Cool Mist humidifier – an easy to maintain humidifier that has been going strong for us for three years. We replace the filter monthly and use these to help keep things extra clean. It’s not as fun as the animal-shaped humidifiers, but so many of our friends have had to replace those every 6-12 months. This money-saving lady can’t handle that! I’ve also heard nightmares about cleaning the crane; mold filled humidifiers will not help anything. 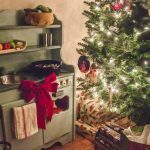 This Honeywell humidifier is incredibly easy to clean. We use dish soap, hot water, and vinegar monthly and it only takes ten minutes. We LOVE shine a light books from Usborne. If you’ve never seen them before, you use a flashlight to reveal hidden pictures on each page. They’re informative, fun, and as they’re read in the dark, sometimes make bedtime go extraordinarily well. 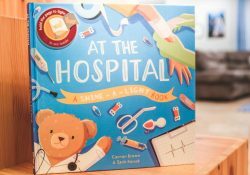 At the Hospital: A Shine A Light Book is one of the best food allergy books for your family because it ties in a big part of food allergies – the hospital. 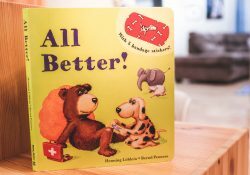 We initially purchased this book because Ollie went through a period where he got really excited whenever he spotted a squirrel or chipmunk. 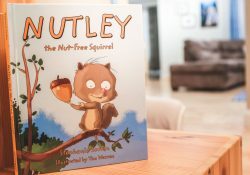 Nutley the Nut-Free Squirrel is a very short and simple story, but we do enjoy it from time to time. It isn’t one Ollie has memorized like Max, but it does stay in the rotation. This is another book I might donate to local libraries for a toddler specific allergy awareness story time. 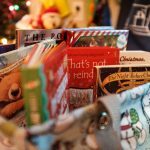 As an added bonus, all proceeds from this book are donated to FARE. You’re supporting a great cause while educating! With Ollie’s incredible calm about his allergies, Jonathon James and the WhatIf Monster is more for me right now. I like feeling prepared for when he is plagued by inevitable food anxiety. He’s a lot like me in many other aspects of life, including asking “what was that” with every noise. I’m sure it’s only a matter of time before he experiences anxiety. Sorry, kiddo! 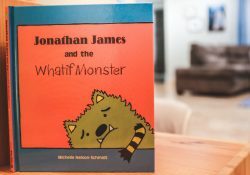 The WhatIf monster helps conquer Jonathan’s self-doubt about trying all kinds of new things, food and otherwise. Even if he doesn’t need the message right now, Ollie enjoys the rhyming story and it’s a good way to remind myself to not be too overprotective and worried all the time. I will warn there is a page with spaghetti with sauce so if that presents an allergen that can cause distress, maybe you don’t want this book. We have many books that feature allergens and use them as an opportunity to discuss safe alternatives for Ollie if he brings it up, but I know this might not work for everyone, so I like to give fair warning. 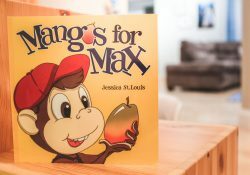 Mangos for Max is Ollie’s absolute favorite food allergy book. I love that it introduces Max as the protagonist who can do all kinds of fun things and only mentions his food allergies towards the end. Kids fall in love with super cool Max from the start and they are even more excited when Max has allergies just like them. It teaches a few simple lessons, as it mentions hand washing, label reading and staying away from the food of friends. My one gripe is that it only mentions hand washing before snack and not after. We always add in that everyone washed their hands again before heading to the playground. 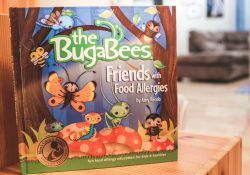 I purchased The Bugabees: Friends with Food Allergies because I wanted to preview it as a donation option for Food Allergy Awareness Week 2018. I’m working with a number of local libraries to host allergy aware story times and thought this would be the perfect book. Some of the children’s librarians love it and a few feel it is a bit advanced for their storytime crowd. In those instances, we are going with Mangos for Max instead. The BugaBees goes through all of the top 8 allergens with fun, repetitive rhyming. As a multiple allergy parent, I appreciate that it talks about multiple foods from our list and always ends with “fun anyway.” The book goes through a number of locations and tries to keep food allergies more light and optimistic. 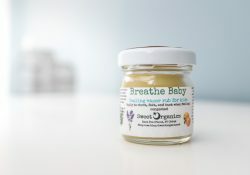 Breathe Baby Organic Vapor Rub is made by a local VT mama. Check out her Etsy shop! It is all we use when Ollie is sick. Have you heard the Vicks on the feet trick? Here’s how to do it toxin free. We rub this on his feet, back and chest to help with any bit of stuffiness. It works wonders. Ollie likes it and even asks for it when he is sick. There is an adult version too. I wish I had it on hand when the sickness hit my husband and me early this year. These products have enabled us to stop using Cerave. I am a fan of anything that cuts toxins out of our life. The lotions and dream creams smell amazing and our some of the best lotions for eczema. We use the sweet orange dream cream in the morning and the lavender at night. At the advice of another consultant, we mix some dream cream and lotion together for all over and use the dream cream alone for problem spots. Using all lavender scents at night makes for a soothing and relaxing start to the bedtime routine. The fresh, citrus scents in the morning are refreshing and awakening. Mixing also works well as the dream cream is more expensive (it contains more healing essential oils), you save some $ stretching it further! We all know that’s a win in my book. Full disclosure: After a few weeks of using these products, I loved the results so much I decided to join Pure Haven. You’ll be linked right to my site. Please reach out if you have any questions or need any help. If you were lucky enough to get a free EpiPen case from Mylan when they were doing that promotion, these cases aren’t necessary. For everyone else, these cases are great. Much like the larger “Med Bag Bag,” these are thermal and have a carabiner. These cases are ideal for small outings when you don’t want to haul around a full kit. When we go outside, even if right outside our own own home, our EpiPens are in this case and attached to our body. Ollie knows what the case looks like and has reminded family members to get his EpiPens before venturing out for a walk. This is our “Med Bag Bag.” The carabiner means it is always easily located if clipped to the inside of a bag and that keys or a wallet with a strap can easily be attached. 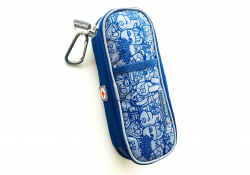 It is thermal, which helps protect temperature sensitive epinephrine, and is all around the best med bag for daily use. 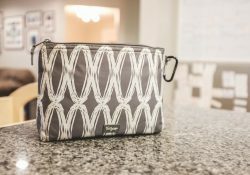 We keep this stocked with other emergency kit necessities and take it everywhere. Read all about everything inside here. These are my absolute favorite pajamas. They are durable, thick 100% organic cotton goodness. I am always on the lookout for a Hanna sale and LOVE scoring used Hanna Andersson at garage sales or consignment shops. I’ve also had good luck finding Hanna on eBay. 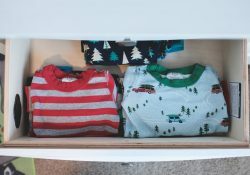 The patterns are adorable and with tons of “Hanna & Friends” character pajamas, you’re sure to find a pair your child will love. I have Curious George on our wish list right now. We also use their Short Johns in the summer. My son doesn’t mind the thicker fabric, even in the warmer months. I’m working on getting all of the plastic out of our kitchen. These were one of my first purchases many years ago and they still look brand new! 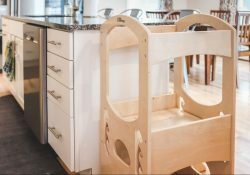 Now that we’re cooking with our toddler, I appreciate the durability even more. These have survived multiples falls from our learning tower. We also use the labels to practice color and number recognition. These are the best dairy-free cheese shreds our family can use. 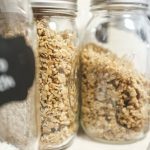 Most I’ve found contain nuts or pea protein. 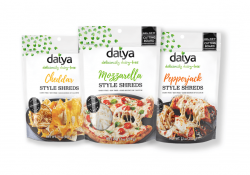 Daiya’s Cutting Board Shreds are delicious, melty, cheesy goodness. We made Ollie his first plate of nachos with some cheddar and pepper jack shreds. I almost cried watching our toddler dig into the amazingness that is a plate of nachos. Join their mailing list as they often send coupons! You can’t buy directly from Daiya but they have a handy product locator tool on their website. This soy butter is phenomenal (in all flavors, but my go-to is the Slightly Sweet). I ate an English muffin with peanut butter every morning for most of my life. This is the only substitute I’ve found that I 100% enjoy just as much. It’s also organic and non-GMO, which is incredibly important if you’re going to consume soy. You can never have too many snacks. EVER. Organic applesauce pouches go everywhere with us. You’ll find them in purses, backpacks, med bags and jackets. 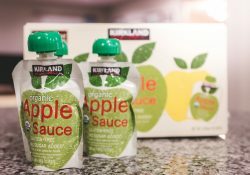 If you have a Costco nearby, the Kirkland brand organic pouches cost less and have no added sugar. We also use applesauce as an egg substitute when baking. 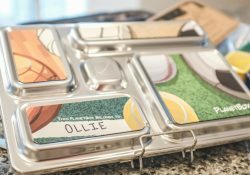 One pouch is usually perfect for a small batch of cookies, muffins or pancakes. I’m from Vermont. Maple syrup runs in my blood. 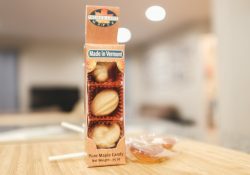 This family-run business makes all of their maple candy on site with nothing but pure maple syrup. The facility is nut free (the maple walnut candies are made elsewhere). Colleen, one of the owners, is incredibly responsive and will answer any question you have. They also make specialty maple candies for every holiday. I love getting themed candies as most other holiday-specific treats are not safe. If your child enjoys fruit leather, these are the ones you must buy. 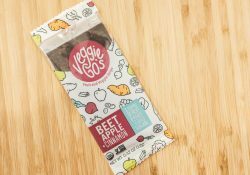 Veggie Go’s fruit and veggie strips are organic, non-GMO, and have absolutely no added sugar. In fact, there are only 2 grams of sugar per strip as there is a full serving of fruits AND vegetables in each one. You get the best deal buying in bulk on Amazon but I’ve also seen them at Whole Foods and local health food stores. 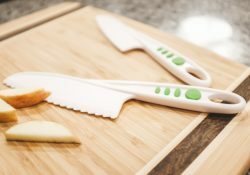 We love cooking with our toddler and these curious chef kid’s knives are his favorite part. They’re sharp enough to actually cut most fruits and vegetables but I feel 100% confident he can’t cut himself. 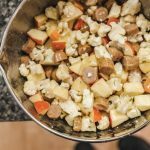 When helping, he always samples as well, sneaking in extra healthy servings while keeping himself entertained so we can meal prep. This Little Partners Learning Tower is a staple in our house. 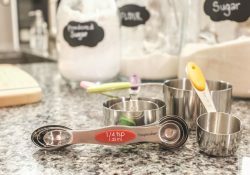 It provides a safe way to involve your child in cooking. It also fosters independence as children can easily climb in and out on their own. My son will sometimes get his own quiet boxes and bring them to the tower for calming entertainment. He also sometimes climbs atop it like a wild monkey. This is a safe, sturdy, and incredibly useful fixture for any house.